So who is pining for Pinterest Invites? Heard of the latest sensation? Pinterest is a virtual pinboard. Pinterest allows you to organize and share all the beautiful things you find on the web. You can browse pinboards created by other people to discover new things and get inspiration from people who share your interests. People use pinboards to plan their weddings, decorate their homes, and share their favorite recipes. It’s highly addictive, and you could spend hours a day on it if you’re not careful. 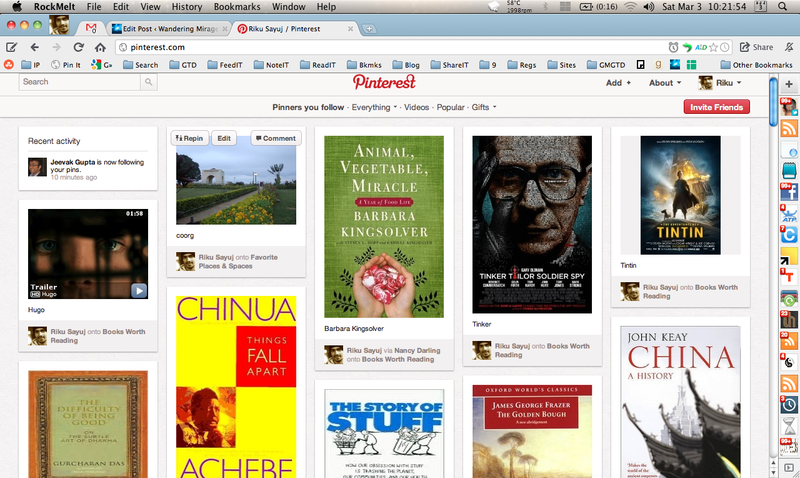 Take a look at my Pinboard & make sure to follow me on Pinterest. If you are curious about the browser layout, it is Rockmelt magic. If you’d like an invite you can leave your email in the comments section and I will try to send you one. If you really really want the invite, you may: Follow me on twitter @RenegadeTramP OR Add this blog to your RSS reader OR Follow my blog @ Networked Blogs OR Like my facebook Page. Do any two of these and you have a 100% chance of getting an invite sent to you. I would love to get an invite! You have to provide an e-mail address for me to send you an invite.